This plugin adds the ability to bulk edit the creator of gravity forms entries en masse. Bulk edit the creator of gravity forms entries. There are times when you need to change the creator of multiple entries. In native Gravity Forms, it is only possible if you open and edit individual entries one at a time. 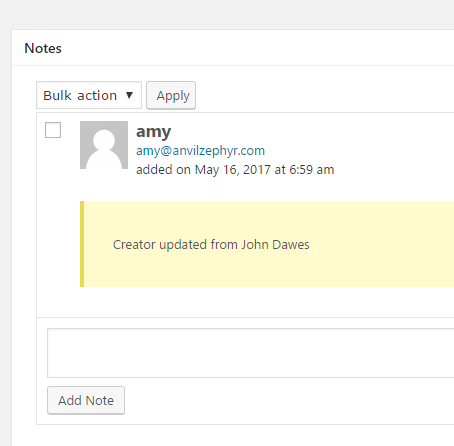 This plugin allows you to bulk edit the creator using the bulk edit drop down and a drop down of users so you may select a new creator and update multiple entries at one time. There are filters that allow you to change the verbiage in case the creator is called something else like ‘Author’ or ‘Manager’. The entry is stamped with a note indicating who changed the creator, who the previous creator was before the change and when the change was made.